Any diagnosis of cancer is scary. According to the American Cancer Society, an estimated 1,735,350 new cancer cases will be diagnosed in the United States during 2018. Some of these cancers will be easily treated. However, others will cause chronic pain and symptoms which make it impossible to engage in daily life. If this happens to you, then Social Security disability may be an option. Your condition must make you physically or mentally incapable of working for pay. Your condition must be expected to last at least a year or be terminal. You must have paid enough into the Social Security system to qualify for benefits. 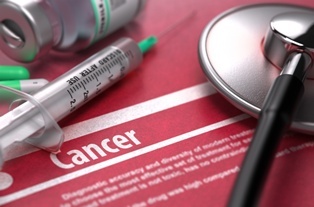 What you can expect as your cancer progresses. What the potential side effects are from your treatment. Whether you will be able to work. If you will not be able to work or your cancer is expected to be terminal, then it is important to consider Social Security disability benefits. Soft tissue cancers of the head and neck (Section 13.02). Soft tissue sarcoma (Section 13.04). Salivary gland cancer (Section 13.08). Skeletal system – sarcoma (Section 13.11). Maxilla, orbit, or temporal fossa cancer (Section 13.12). Cancer of the nervous system (Section 13.13). Pleura or mediastinum cancer (Section 13.15). Esophagus or stomach cancer (Section 13.16). Cancer in the small intestine (Section 13.17). Cancer in the large intestine (Section 13.18). Liver or gallbladder cancer (Section 13.19). Cancer of the female genital tract (Section 13.23). Cancer where the primary site is unknown (Section 13.27). Cancer treated by bone marrow or stem cell transplant (Section 13.28). In order to qualify because of one of these conditions, you must meet the specific eligibility criteria set out in each section. However, these are not the only ways to qualify for Social Security disability benefits. Regardless of how you qualify, your next steps should be the same. Your next step should be to contact an experienced Social Security disability lawyer. Your attorney will help you fill out your application completely and with the required documentation. Any omissions can lead to a denial or a delay in your claim. Accordingly, it is important to get your application right the first time. Medical evidence specifying the type, extent, and site of the primary, recurrent, or metastatic lesion; this includes doctors notes, x-rays, ultrasound stills, and surgical reports. Operative notes which indicate diagnostics and results of any and all operations such as needle aspirations and biopsies. Pathology reports indicating diagnostics of cell degeneration as well as size, shape, and appearance of the cellular mass. Hospitalization summaries of all appointments, procedures, and findings pertaining to the diagnosis and treatment of the detected mass. These should include details of the findings during surgery and, whenever appropriate, the pathological findings. Evidence of recurrence, persistence, or progression of the malignancy, the response to therapy, and any significant issues following removal of the mass. Every claim starts with an application for disability benefits. However, some claims may be decided more quickly than others. For example, if your cancer is included in the Compassionate Allowances program than you may receive a decision about your eligibility within weeks rather than months. Contact us today to review your disability options and make sure you qualify before filling out your application. We know you do not have time to lose, so let us help make sure your application is in order to prevent costly delays in getting your deserved benefits. Call us today or contact us via this website to learn more.